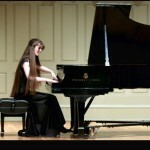 Anne Robinson is a professional pianist and pedagogue in Cottage Grove, WI where she keeps a private studio. She appears regularl in local performance and maintains multiple studios including the Elite Artistry Program in Waunakee, Monroe Street Arts Ceneter in Madison, and the Steinway Piano Gallery on the west side. She believes in cultivating a love for music making from the very first lesson, in balancing personal enjoyment with self-discipline, and the benefit of music education for everyone. Multiple competition awards including the Honors Chamber Music Competition of the Boston Conservatory in 2015, the prestigious Sigma Alpha Ioata scholarship competition of 2010, the Rising Stars Concerto Competition of La Crosse, WI in 2008. Academic awards include merit scholarships, talent sponsorships, and teaching assistantships in music history. Honors include performance debuts for composers Louis Andriessen and Gunther Schuller. Anne Robinson has studied with Max Levinson, Dr. Peter Miyamoto, Ayako Tsuruta, Dr. Gloria Chuang, and Dr. Mary Tollefson. She has appeared in many masterclasses, notably with Dr. Melvin Chen, Michael Lewin, Dr. Jonathan Bass, Dr. Janice Weber, and Dr. Hugh Hinton. Her pedegogical influences include Dr. Julie Knerr, Irina Gorin, Marvin Blinckenstaff, and Dr. Edwin E. Gordin. Let others know about Anne Robinson . Did this teacher help you to learn? How long did you take lessons? Are you still playing music? Share any thoughts or stories you have so that others can know about this teacher!